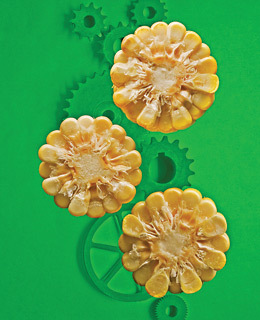 Are corn husks better than corn for producing energy? Ethanol is the alternative fuel that could finally wean the U.S. from its expensive oil habit and in turn prevent the millions of tons of carbon emissions that go with it. The Department of Energy has doubled its 2005 commitment to funding research into biofuelsany non-petroleum fuel source, including corn, soybean, switchgrass, municipal waste and (ick) used cooking oil. Already, half of the nearly 11 billion bushels of corn produced each year is turned into ethanol, and most new cars are capable of running on E10 (10% ethanol and 90% gas). Yet the eco-friendly fuel is beginning to look less chummy of late. Some of the 114 ethanol plants in the U.S. use natural gas and, yes, even coal to run the processors. And ethanol has to be trucked. Existing gas pipelines can't carry it because it corrodes iron. Then there are the economics. Producers depend on federal subsidies, and increasing demand for corn as fuel means the kernels keep getting pricier. That's why researchers are prospecting for more alternatives, preferably ones that don't rely on food crops or a 51 cents-per-gallon tax break. Municipal waste, wood pulp and leftover grain and corn husks are all quite attractive; they can produce something called cellulosic ethanol, which contains more energy than corn. But they don't give up their bounty easily, so for now they're more expensive than corn-based ethanol to produce. Undeterred, researchers at several cellulosic-ethanol plants are developing innovative enzyme concoctions and heating methods to make the process more economic. Nothing like haste to make something out of waste.